Today, FLVS employs more than 2,200 support staff and Florida certified instructors who use a wide variety of resources and integrated systems and have access to professional development opportunities. FLVS students are digital natives and benefit from more than 180 FLVS online courses. FLVS boasts more than 4.1 million semester completions since its inception in 1997, with more than 492,000 semester completions in 2017-18. Our students continue to outperform state averages on End-of-Course Exams and on Advanced Placement Exams. FLVS provided courses and services to 65 school districts through 35 Florida District Franchises. In 2017-18, students attending FLVS District Virtual Schools successfully completed more than 168,800 semester completions. 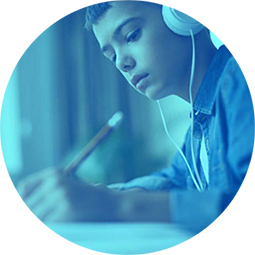 In addition to working directly with Florida students, FLVS has expanded due to demand beyond state lines, providing its courseware experience to online and blended learning programs in schools and districts across the nation. 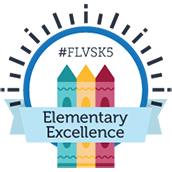 This expansion ultimately allows FLVS to stretch every dollar invested in Kindergarten–12 state education programs and helps our Florida schools achieve their academic performance goals. All that FLVS has accomplished is the result of dedicated students, instructional and administrative staff as well as the amazing parents of our students. We are grateful for the continued support from the Governor, legislators, and our Board of Trustees. Thanks to everyone who shares our vision, FLVS has been able to show the value of online learning in providing flexible learning opportunities, improving educational outcomes, and preparing students for future success across Florida and around the world, both in the job market and transitioning to their next academic endeavor. This article was published in the FLVS Annual Report 2017-18. 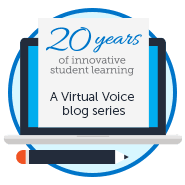 This entry was posted in Educator Edition, Full Time Edition, Homeschool Edition, Parent Edition, Student Edition and tagged FLVS, Online Curriculum, Student Success on April 10, 2019 by The Virtual Voice.